If you live in Australia, you not only are able to buy a diesel powered Subaru Outback with an automatic transmission, but the price has dropped significantly. Subaru Australia has announced significant changes to the 2013 Outback 2.0 Diesel Premium model. It will now be offered with its first automatic transmission and it will get a price drop of $4000. The standard Outback 2.0 Diesel also gets a price reduction of $1000, yet adds factory-fitted satellite navigation. And the diesel variant adds new design alloy wheels and a color information display. It seems like the Australians get all the goodies and price perks. But why doesn’t Subaru offer a diesel variant here in the U.S. and why the price drop for the Aussies? Subaru has dropped prices in Australia because sales of the Outback SUV have slowed during 2012, and Subaru seems intent on keeping sales up as we start the new year. A similar thing is happening in Europe as Subaru UK has extended the warranty to 5 year/100,000 because of slow sales. They also recently dropped the WRX, WRX STI and Impreza from the UK lineup due to slow sales. But here in the U.S., things are much different. Subaru has seen record sales in 2012 and has expanded production capacity in their Indiana plant. Here in the U.S., buyers have been asking for Subaru to bring a diesel variant to North American shores for years now. So why doesn’t the Japanese automaker appeal to buyers requests in the their strongest global market? The fuel-efficient Subaru diesel boxer engine would likely be very popular on U.S. shores. Subaru built their first diesel back in 2004 and incorporated the horizontally opposed boxer technology into their diesel engine. The design cancels out inertial forces that cause vibration and noise, thanks to their horizontally opposed pistons and requires no balance shafts. The design is unlike inline diesel engines in that the Subaru Boxer Diesel features low vibration, a low center of gravity, and high rigidity. The advantages are also seen in the lightweight and compact configuration that allows the Subaru cars to keep their excellent drivability. The compactness is revolutionary and unlike any other small diesel including Mercedes and Audi. What don’t we see a diesel Subaru in the U.S.? Part of the reason Subaru doesn’t offer a diesel in North America is because of economics. Historically, there’s always been a higher demand for gasoline here. The federal government taxes every gallon of fuel sold, and our tax system is biased toward gasoline, making it cheaper to buy than diesel. It’s the exact opposite in Europe and in other global markets like Australia. Diesel is cheaper to buy than “petrol”. In the U.S., gasoline is much cheaper than other parts of the world and is the popular choice. It’s hard to convince consumers to pay an extra $5-7,000 for a diesel vehicle, and then ask them to pay more at the pump for diesel fuel. Another factor is the way U.S. regulations for diesels are different than Europe. U.S. regulations only allow a diesel to emit 0.07 grams of NOx per mile, making compliance much more costly for an automaker. European emissions standards allow a diesel to emit up to 0.29 grams of nitrous oxide (NOx) per mile. The third factor why the U.S. gets left out of getting the Subaru diesel variant is that it’s expensive for a manufacturer to get their diesel engine certified here in the U.S. which again adds to the cost of that diesel car. To meet U.S. regulations, automakers are required to use expensive after-treatment systems that in some cases inject an aqueous urea solution to handle the NOx. The added expense of course means an even longer payback period for the consumer. How soon will we see a Subaru diesel in the U.S.? Don't hold your breath. Except for VW who offers a small diesel variant, at current fuel prices, most American small-car buyers aren't willing to pay extra for that Subaru Outback diesel. And it’s too expensive for Subaru to get an Outback certified here in the U.S. But that could change if U.S. fuel prices take off more abruptly than analysts predict. If that happens, we could see Subaru and other manufacturers be willing to make the commitment to spend the money. 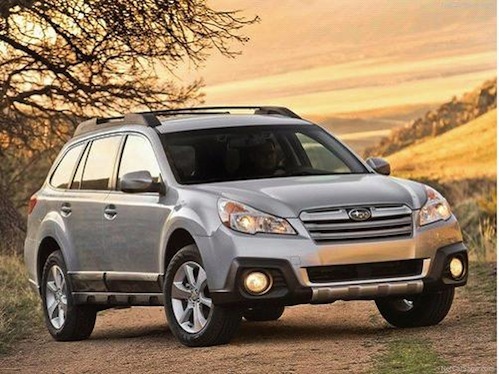 Until then, the Europeans and Australians will get to enjoy the benefits of the 2013 Subaru Outback diesel variant with a six-speed standard transmission and now with Subaru’s newest Lineartronic Continuously Variable Transmission. It's unforgivable that the Boxer Diesel has not been allowed to be sold here in North America, much less to the USA. Is diesel for everyone? No, not really. I know some people who would be turned off by the clattering noise that diesels make. I know that there are people who want an automatic transmission as an option. But so what? There are people who need one or want one for either business or pleasure.